Lambrusco is a red sparkling wine that in Italy boasts a big farm and popular tradition. A sparkling wine is a wine which contains a certain amount of bubbles, that is a certain percentage of carbon dioxide; in particular it is a sparkling wine with a maximum pressure of 2,5 atmospheres, unlike other sparkling wines which should have a pressure of at least 3 atmospheres. There are two types of sparkling wine: natural sparkling wines, produced with the method Champenoise or the method Charmat, and artificial sparkling wines, produced with the help of pumps, which create the empty space in order then to blow into the carbon dioxide in containers of steel where wines are kept. The process of production of artificial wine creates wines of lower quality. The choice of method depends on the type of grapes which is used, because not all grapes are ideal for the re-fermentation of the product; so it is fundamental the choice of grapes for the elementary wine in the case in which you want to obtain a sparkling wine with a natural fermentation in bottle. The grape-harvesting should be made with a week in advance compared with the traditional grape-harvesting for dry wines, in order to achieve an alcoholic strength between 9-12° in order to produce sparkling dry wines. Also total bitterness should be superior to 6 grammes for litre, in order to obtain better results. Once that elementary wine is obtained, you can pass to the production of sparkling wine following one of different procedures before explained. The foam of Lambrusco spontaneously comes into the world. Once men who worked in the cellars used the so called “re-fermentation in the bottle” or rather using the strong temperature excursion of winter, they broke the fermentation and then started again the following spring, when wine was bottled. Once bottle was uncorked, the foam appeared. Nowadays the majority of manufacturers prefers the Charmat method. 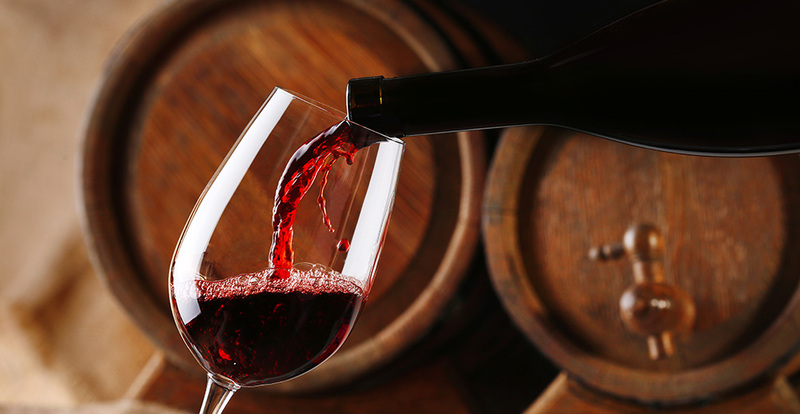 This procedure consists of putting the elementary wine in big pressurized and closed containers of steel, known autoclaves, where natural selected yeasts are introduced and they combine with sugars and mineral salts causing the re-fermentation. The yeasts, which are used, are natural elements present in nature and from always are used for the transformation of sugars in alcohol. In order to produce Lambrusco, the yeast, which is usually used, is Saccharomyces Bayanus, employed in the fermentations for wines with low alcoholic strength. Once the re-fermentation is achieved, wine is moved in another autoclave and submitted to an hyperbolic percolation in order to avoid the dispersion of carbon dioxide. The temperature is quickly lowered in order to obtain the tartaric precipitation, after wine is one more time filtered in order to remove the tartaric acid, which was set down. Wines produced with this method usually are more sour and more fresh, with an high effervescence. Moreover the bottling of sparkling wines is a very important and delicate procedure because in the process you can risk wasting carbon dioxide obtained in autoclave; then you have to pay attention to the closing of bottles, which should respect specific features in order to bear the pressure and to not risk breaks. For example bottle of sparkling wines have a glass of big thickness, recommended to resist to stand up to the inner pressure; the bottom doesn’t show sharp edges, weak points mainly exposed to breaks. Finally the cork bungs with classical stand, which guarantees superior resistance to the pressure.